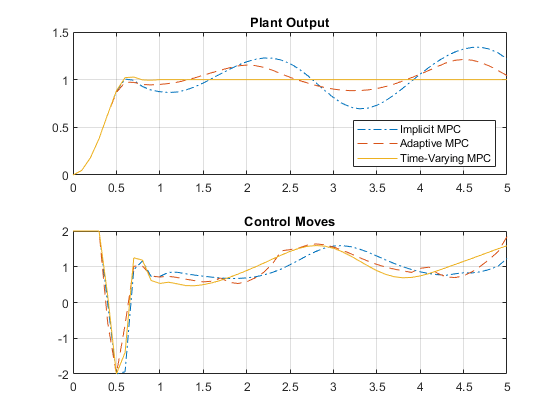 This example shows how the Model Predictive Control Toolbox™ can use time-varying prediction models to achieve better performance when controlling a time-varying plant. Linear MPC controller based on a time-invariant model, which is updated at each time step. Linear MPC controller based on a time-varying prediction model. In this example, the plant is a single-input-single-output 3rd order time-varying linear system with poles, zeros and gain that vary periodically with time. The plant poles move between being stable and unstable at run time, which leads to a challenging control problem. Generate an array of plant models at t = 0, 0.1, 0.2, ..., 10 seconds. Convert the models to state-space format and discretize them with a sample time of 0.1 second. The control objective is to track a step change in the reference signal. First, design an MPC controller for the average plant model. The controller sample time is 0.1 second. Set hard constraints on the manipulated variable and specify tuning weights. Set the initial plant states to zero. Run a closed-loop simulation to examine whether the designed implicit MPC controller can achieve the control objective without updating the plant model used in prediction. Set the simulation duration to 5 seconds. Use the mpcmove command in a loop to simulate the closed-loop response. % Get the real plant. % Update and store the plant output. % Compute and store the MPC optimal move. % Update the plant state. Simulating MPC controller based on average LTI model. Run a second simulation to examine whether an adaptive MPC controller can achieve the control objective. Use the mpcmoveAdaptive command in a loop to simulate the closed-loop response. 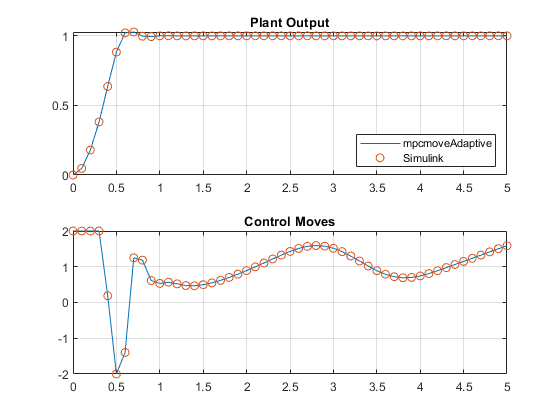 Update the plant model for each control interval, and use the updated model to compute the optimal control moves. The mpcmoveAdaptive command uses the same prediction model across the prediction horizon. Simulating MPC controller based on LTI model, updated at each time step t.
Run a third simulation to examine whether a time-varying MPC controller can achieve the control objective. The controller updates the prediction model at each control interval and also uses time-varying models across the prediction horizon, which gives MPC controller the best knowledge of plant behavior in the future. Use the mpcmoveAdaptive command in a loop to simulate the closed-loop response. Specify an array of plant models rather than a single model. The controller uses each model in the array at a different prediction horizon step. Nominals = repmat(nominal,3,1); % Nominal conditions are constant over the prediction horizon. Simulating MPC controller based on time-varying model, updated at each time step t.
Only the time-varying MPC controller is able to bring the plant output close enough to the desired setpoint. To simulate time-varying MPC control in Simulink, pass the time-varying plant models to model inport of the Adaptive MPC Controller block. Simulating MPC controller based on LTV model in Simulink. 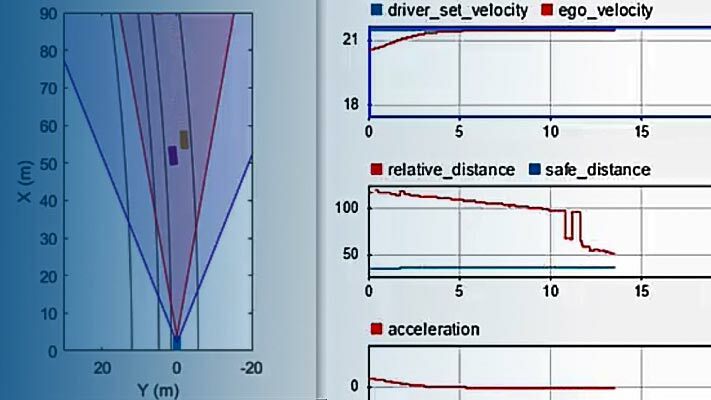 Plot the MATLAB and Simulink time-varying simulation results. The closed-loop responses in MATLAB and Simulink are identical.